The crystal clear 7” LCD Monitor is a perfect addition to any driver that needs assistance backing up. See the whole world behind you in rich colors. It is also an LCD monitor so it is very light as well as thin. Split the screen to see up to 4 cameras. 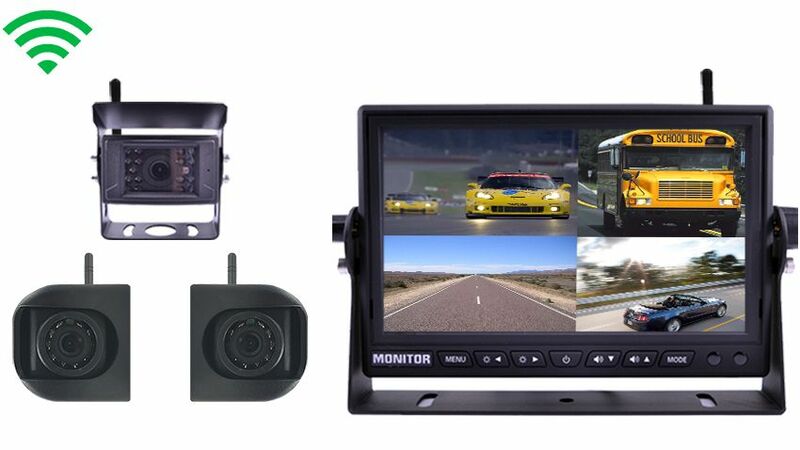 This monitor is compatible with all our cameras and any car, it connects to any power source or a cigarette lighter. It can mount on your windshield or dashboard (mount included). Super easy installation.It also comes with a cigarette lighter Adapter, so you just plug it right in or hardwire it. By using the “CUSTOMIZE AND UPGRADE” section at the top right of the page, you can choose which style of backup camera fits your needs and budget. This system comes preconfigured with 3-5 cameras however, we have different styles for all kinds of uses. Choose which configuration best fits your budget. The RV and Travel trailer Box camera Has a 120° Degree viewable angle, its waterproof and has auto night vision. Has optimal reception for up to 150ft this allows it to work perfectly without interruption in any vehicle. The camera is one of the most durable we have, with incredible adjustability and night vision clarity. The RV Box camera has a metal sun shield visor to protect you from glare and pebbles. This is by far our toughest built camera. It has been regularly used in cars, vans, buses and even industrial sized caterpillar trucks, operated in the harsh oil sand of Canada. This camera can take a direct hit from a rock and it will still work like new. It has also been very popular with RVs, because its housing allows you to install the cameras on multiple sides of your RV. In this system you get 3 cameras and you can mount these cameras anywhere you want. They work next to each other or far from each other it makes no difference. Basically its up to you where you want them and what you want to see, the possibilities are endless. This camera is also a wireless camera so there is no need to run cables through your Car or RV. TadiBrothers only sells one type of wireless camera because its the ONLY one on the market that is reliable. This wireless camera has BUILT IN transmitters and just simply has an antenna connected. If you have a pre-installed Furrion housing on your Trailer or RV, we have a bracket adapter to make our camera plug and play. Large vehicles like RVs are notorious for their blind spots. Just changing lanes can be a difficult and nerve-wracking process if you are relying on small rear view mirrors. This is why so many RV drivers these days are investing in a rear and side view camera system. These affordable cameras can save you a whole lot of money on vehicle repair expenses, and they are one of the most effective ways to make your commute safer. This mini wireless camera is perfect for drivers who want tremendous performance in an affordable package. This Digital Wireless Rear View Camera System has a flawless range of 150ft+ (when we tested it in open space we have seen a range of 215ft). This Digital camera is compatible with any of our digital monitor. It is 100% weather, water, and mud proof. It is extremely durable and has been tested and consistently used in the harshest environments. Put any compatibility issues aside. With the TadiBrothers promise you have our 30 day guarantee to return the item for an exchange or a full refund. "Last week when I was driving to one of our rallies and my camera fell off the rear while driving down the road I did notice it right away obviously, but I had to go and pick up the camera I wasn't sure that I was going to work because I tore out the cable but it works perfectly. it was also very impressive considering that It fell off my RV when I was driving 70 miles an hour. The test of the system was durability and it passed with flying colors I'm very very happy with it." "I have been looking for a Digital system for quite some time, I finally found this company and they have definitely delivered on the product. Last week I finished installing my three camera digital building system and it worked flawlessly the first time I powered it up I have to play a little bit with the features just to better understand it but it really does look good daytime or night time in fact I was very impressed with how crisp the picture looked while I was driving down the road in the day. I'm also very happy with the fact that when the camera is on while driving down the road it looks consistently well with no interference other companies don't even give you that option"
"I tested this camera on my farmhouse and it's actually 135 feet away from my main house so far the pictures good looks amazing I've tried it out during the day and at night I'm very happy with it I think I'm going to add a few more cameras around the farm. The only complaint I have is that I wish I could turn the camera on its side but it won't let me do that other than that the quality is solid the images solid the product overall was very easy to install and I've been very happy with the consistency of it. " "I set up my system so it turns on only when I go in reverse in the past when I've tried other systems it always took it a few seconds to turn on but with this system it really was instant is if it was waiting to broadcast the image this is not typical of many systems I'm very happy with this product. It was also very easy to install and after three months of using it I have still not seen any interference. The night vision is amazing and the CCD high definition was definitely worth the investment. "